AMS No Dig Ltd, commissioned by a main contractor, has recently completed the installation of multiple cable ducts into an existing substation by below ground HDD techniques. The scheme was originally designed to be completed by conventional HDD techniques using a standard surface launch drilling rig. 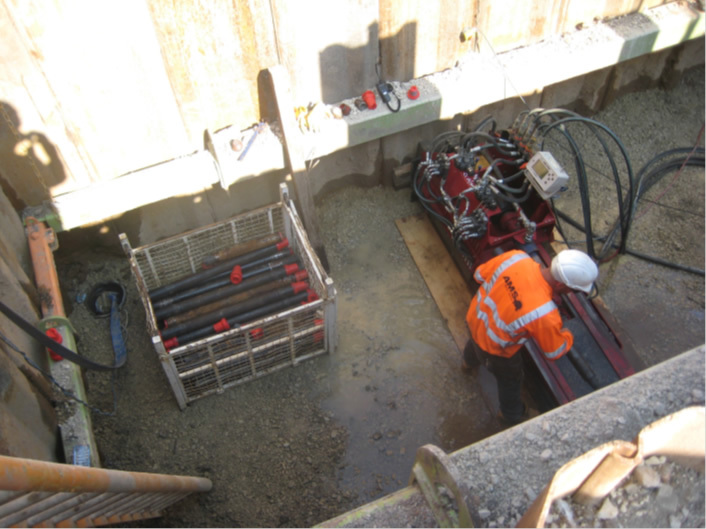 Drilling from the surface each duct was to pass under numerous buried services and into the existing substation. However, due to site constraints it was not possible to position the drilling rig in its intended drill position which meant a surface launched HDD was not feasible in order to meet the required drill profile. 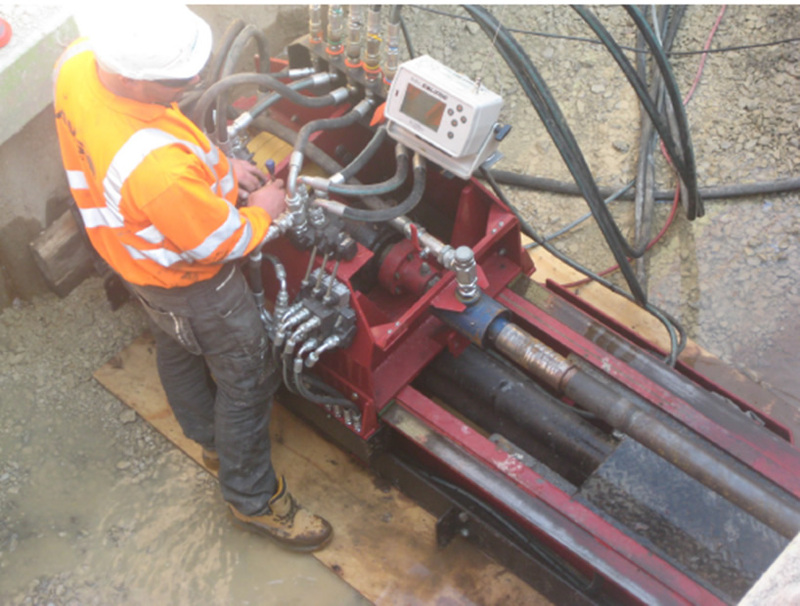 AMS engineers looked at other trenchless solutions such as auger boring and micro tunnelling before settling on a pit launched HDD which offered the simplest and most commercially beneficial solution. AMS No-Dig’s new Pit launch HDD rig which fitted the bill perfectly. The Pit Launch Drilling Rig is a heavily engineered machine capable of producing 12 tonnes pull force with 3000 ft/lbs of rotary torque and is fully steerable. Utilising pressure compensating load-sensing hydraulics, the rig will only demand the required amount of power from the 126 BHP Cummins 4BTA diesel engine. Rotary torque is produced by a proven Poclain MS11 Hydraulic piston motor. To keep the overall length to the minimum, the breakout wrench is designed to travel up the mast during the final ream and product installation. This allows a reamer of up to 355mm diameter to come up onto the bed of the rig with the product pipe behind it. A hydraulically controlled push plate is fitted to the rear of the mast to clamp the rig into position between the pit face and the rear wall. The Pit Launch is an all hydraulic rig. There are no electrical controls in the pit even the engine emergency stop is on a flying lead that can be removed at night. 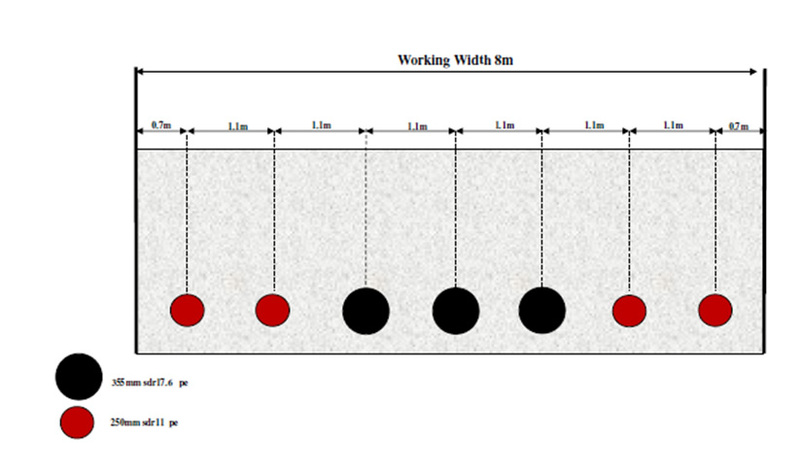 Designed to operate 1 metre long drill rods the rig will set up in a pit approximately 3 metres long x 1.6 metres wide. The Power Unit will remain on the surface connected via a 10 metre long hydraulic umbilical. In total seven cable ducts were installed from a single 8m wide by 4m deep shaft. Each pilot was drilled with a 1m separation from the shaft on a profile up to surface within the substation.